How Do You Find an Experienced Builder? How Can You Find an Experienced Banker? 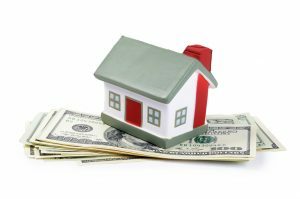 How Much Cash Will I Need for a Down Payment? Paying for a house that's being built on your land is very different from buying a new house from a builder, or even buying a custom home on the lot a builder owns. To build a custom home on your land, you'll need a construction loan and a permanent loan and there’s many differences between the two. The permanent loan is the one we all are familiar with, the one where you make a monthly payment to the mortgage company for 15 or 30 years (hopefully less if you can). You can't borrow money using a permanent mortgage for buying the land and building the home, so you need a construction loan, and there's a lot that's different about a construction loan. A construction loan comes from a bank, not a mortgage company, because the bank likes to do short-term loans as opposed to the longer-term mortgage. The construction loan is going to have the term of about a year. During the term, you'll pay the banker and you'll have interest payments on that loan. When the house is complete, you get a permanent loan. The bank loans you their own money, which is different than a mortgage loan. You'll typically have to put more money down on your construction loan than you would if you were purchasing a home that was already built. For example, the bank might ask for an extra year of tax returns. They might want to see your business tax returns if you're a business owner. Or they might want to know more about your past—if you have a divorce or something else that affects your financial history, you may need to have a conversation with the banker about that. A lot of banks don't do construction loans or don't know how to do it well. Choose a builder you trust who can help you through the process because they've been through it before with other clients. What happens once my construction loan is approved? As you can see, the amount you're actually paying for the house doesn't figure in this equation. So, if the appraised value is $200K, the bank will lend you $160K. If your house is only going to cost $190K, then that leaves you with $30K to come up with in cash. After the appraisal is done, and the title to the land has been checked, you'll close on your construction loan and be ready to start building. How do I pay the builder for my custom home as it's being built? You'll pay your builder in installments, commonly called draws, which correspond roughly to specific phases of construction. This process varies widely. In principle, this is how it works: the builder completes a phase (let's say the foundation, under-slab plumbing, and the concrete slab); you pay a certain percentage of the total price. Each time the builder completes a phase, you pay an agreed-upon percentage of the total until the house is 100% complete. Once you've paid the builder 100% of the total, you'll start the process of closing on the permanent loan, or mortgage. From the perspective of the mortgage company, this isn't a new home purchase, it is a refinancing of an existing loan (the construction loan). Basically, you're taking out a new loan that pays off the existing construction loan. Sometimes the first time people hear about a construction loan is from their builder. Naturally, they get suspicious because they probably haven't ever heard of it before! But rest assured, your builder isn't making that up to swindle you. When you think of choosing a builder for your custom home, you’re probably thinking in the context of finding someone with house designs that you love and fits your budget, but surprisingly the builder you choose will also affect your financing choices. Many people looking for a construction loan to build a house on their own land find it difficult to find a bank that will do it. Banks take into account the builder that you are using when making underwriting decisions. Why is that? Incomplete projects are all too common within the construction business. It's risky for banks to approve a construction loan for a home project that is likely to languish due to issues with the builder. There are three main reasons some builders are viewed as much less risky than others. New builders don't have a track record long enough for many bankers to feel confident they can get the project done on time and within budget. A builder who is well-known in the community and has a good reputation among the banks can expedite the loan approval process. When a builder signs a contract with a client for a set dollar amount, that's the price the client can expect to pay. If the price of lumber increases by 40% after the contract is signed, the builder eats that cost, ensuring the client's budget stays the same. Price increases for building materials are more common than you might think! Prices are constantly changing. If you go to a cost plus builder, the price you agree upon could change depending on what price increases the build incurs in materials during the building process. Bankers fear the cost of the building project going up, because that increases the amount they'll have to lend, and increases the chance they'll end up with a non-performing loan on their books. A builder who is cost-effective in his or her building process will find that the homes he/she builds appraise for more than the contract price. The client gets an immediate return on her investment. Banks love it when the appraisal price is more than the cost to build because it takes even more risk off of them. 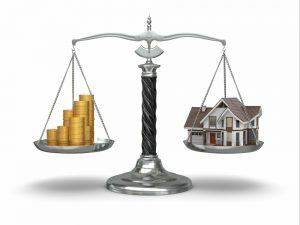 The higher the appraised value compared to the actual price the client pays, the less likely there is to be a problem when it comes time to do the permanent mortgage. If you think finding a great builder for your custom home is a chore, finding the right banker to do the construction loan for a custom home on your land may be even more difficult and intimidating. Shopping for a bank is difficult because it's tough to know what to shop for. Unfortunately, because we don't know what qualifies a bank as a good fit for our unique situation, we often revert to comparing rates. There's so much more to it than that, and I've seen many people get burned by a construction loan bank that wasn't a good fit. Here are some tips for finding a banker who can work with you on your home building project. Going in with this expectation can save you some frustration later on. Also, it's important to know that while banks are highly regulated by the federal government, they have very different attitudes about different kinds of loans. Some specialize in a particular type of loan, such as car loans, business loans, construction loans, etc. You can start by asking your local bank or the bank you’re currently using for checking or savings. If they don’t have a loan officer who does mostly construction loans, or if the loan officer can’t clearly describe their process, then the bank probably doesn’t do a lot of construction loans. That can be a headache down the line, plus their terms may not be very favorable. To find the right bank, ask a few builders what bank they recommend or ask someone you know who has built on their land which bank they used. Ask the bankers to describe the construction loan process—what’s the term (length of the loan), the frequency of interest payments, typical interest rate, and their typical loan amount (meaning what percentage of the cost, or percentage of the appraised value, will they lend)? Loan criteria could include income, debt-to-income ratio, and credit score. You can figure out those numbers for yourself before going through the agony of providing all the documents to the bank. That way, you'll know whether it's worth talking further with that bank or going elsewhere. 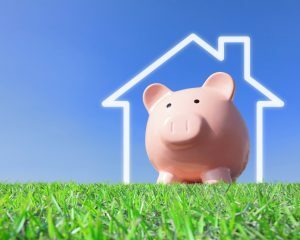 If you find that the loan criteria for multiple banks are too strict for your current financial status, you may need to rethink building while you build up your finances. Bad credit scores, in particular, have a habit of surprising people when seeking a loan, but there are things you can do to fix yours if necessary. Don’t get hung up on shopping for the best interest rate. First of all, the home building process shouldn’t take more than about six months, unless you’re building a complex home or one that’s larger than 4500 square feet. You’re not going to be borrowing the money for very long anyway, and the interest won’t add up to much money. In other words, a few tenths of a percent in rate isn’t worth working with the wrong lender. You're in charge, not the banker. You have the right to ask them to explain the process in great detail until you're satisfied and you understand the details. If they are unwilling to explain the process where you can understand it, go talk to another bank. Even when you find a helpful banker who'll answer your questions and seems to have the loan program you're looking for, go talk to one more just to make sure everything that the banker you like said makes sense. Find out whether the bank has a mortgage department or if they expect you to use an outside mortgage company. If the bank has its own mortgage department, it’s possible that your construction loan process will go more smoothly and that the rates or fees for your construction loan will be less. Why? Honestly, there’s not that much profit (and a whole lot of work) in a construction loan from the bank’s perspective. If they can take care of the permanent mortgage for you as well, they feel like they’re getting more for the work they’re putting into the deal, which works in your favor. "Without naming names, can you tell me about the last construction loan you did for someone whose situation was similar to mine? Similar location, land type, house type and size, and budget?" It's a complex question. You'll have to provide the details of what you're wanting to do, but it will be worth it to see how the banker responds. Why does the banker's experience with similar projects matter? Simple. Every project is unique. Your project is the manifestation of your unique dream—a unique combination of needs, wants, problems, and solutions. Every home we build is different, each one with its own challenges to overcome. You want a banker that's going to work to solve challenges that are particular to you and your home, not one who's going to apply some mass-market formula that might or might not work for you. If they tell you that the loan process is the same regardless of location, land type, and budget, that's a red flag. But if they tell you a story of someone who encountered a few challenges and how they worked to solve those challenges, they might be a good banker for you. We recently worked with a family who came to us after nearly committing to another builder. They'd already applied for a loan with a certain bank known for doing construction loans. We worked closely with that bank and provided detailed drawings and specifications about the client's land. The land is in an older and established rural community, and the comparable homes were older. Their new home would have many features, amenities, and energy efficient components that the older homes lacked, which would make it more valuable than those older homes had been when they were new. Plus, the family had recently purchased the land at current market value. Unfortunately, the bank had its own tried-and-true formula for your run-of-the-mill subdivision homes. They really had no experience with or any idea how to handle the more rural property we were dealing with. As a result, their pool of appraisers didn't know how to properly value the home, and they guessed low to cover themselves. The bank had a high-volume, quick-turn mentality and wasn't particularly interested in solving this family's unique problem, so it simply said "no." Ultimately, the story had a happy ending when the family got connected to a bank that is used to doing construction loans for custom homes in rural communities. The new bank understood the unique value of the property and the unique value of clients who have a dream to live on their own land in a custom home that meets their unique needs. People like that are low risk for a bank because they're typically the more conservative, responsible folks who live well within their means and don't default on bank loans. The right bank will understand the value of not only the property and the house to be built, but also of the client whose dream they are helping come true. The previous question I suggested should set you on the right path and quickly weed out banks who will be of no use to you. But it can’t be the only question you rely on when picking a banker. Those banks are in competition with each other for your business and each has salespeople trying to tell you what you want to hear so you will pick them. At a bank, the salesperson is called a loan officer, and it's their job is to drum up business for the bank. The loan officer sits down to meet with you and tells you about all the great options they have for loans. They give you an application, ask you to bring in all your supporting documents, and make it sound pretty positive at that first meeting. Having dealt with many banks over the years, I thought I would pass along some wisdom about finding the right bank for your construction loan. This wisdom actually comes to me from a banker I've worked with for years, whose judgment and industry knowledge I trust. Assuming you're planning to build a home on your land, here are two more questions to ask any banker and why you should ask them. 1. Does the bank have to follow Fannie Mae and Freddie Mac guidelines? A loan-to-value offer is the percentage of the value of your proposed new home that the banker will lend. Some will do a construction loan of up to 90% of the appraised value, some will only do 80%. The deal is valid, but it might have several contingencies attached. For example, it might require that you own your land or have owned it for some time. That means if you intend to buy the land with proceeds from your loan, you won't get the high loan-to-value (LTV) that brought you into the bank in the first place. When meeting with different banks, don't be intimidated by the fact that you aren't well-versed in construction loans—nobody but the banker is. Keep in mind that the banker isn't well-versed in whatever you do for a living either. Over the last 53 years building homes in central Oklahoma, we've done business with dozens of banks. Some have been excellent to deal with, from both the builder and customer perspectives, some have been OK, and some have been downright difficult if not incompetent. Since getting a construction loan to build a new house is a key element of building a home on your land, whether it's in Oklahoma or somewhere else, I thought it would be helpful to share what I've learned. Like I said before, construction loans for building a home are different from other types of loans. Many bankers will tell you they'll do a loan to build a new home, but not that many are actually good at it. You can ask the banker what title company they use, if they have a list of preferred appraisers, and who does the progress inspections. If they can't give you a ready answer, they might not be good at construction lending, and using a bank like that will lead to delays and frustration. The best banks in Oklahoma City for construction loans will be the ones that have a dedicated team for just that purpose. Oh, and please don't use interest rate as your guiding principle. There are so many other factors, and there won't be much difference in rates anyway. When you calculate the actual dollar difference, you might find you're stepping over dollars to get to pennies. #1 Valor Bank. This is an old, established rural Oklahoma bank under new ownership. The new ownership consists of talented and experienced bankers looking for new opportunities, and their construction lending department is top-notch in customer service, honesty, and follow-through. #2 F&M Bank (and FMB Mortgage). This is a family-owned bank with years of experience in construction lending. For years, I dealt with Chad Johnson in the Crescent branch, but they've recently re-worked their internal systems to make their customer experience even better. #3 Advantage Bank. While not a large bank, Advantage "gets it" when it comes to lending money to build. One unique element is Advantage doesn't have its own mortgage department (as of this writing), so they do business with many mortgage companies around town. This network of connections can help you if for some reason you want to separate your construction business from your mortgage business. #4 Tinker Federal Credit Union. TFCU, like others on this list, has been doing loans for customers to build new homes for years, and is very familiar with the more rural projects. #5 NBC Bank. We haven't done a great deal of business with NBC, but what we have done has been very smooth for our clients and for us. The loan officer we do business with at NBC has a deep background in construction lending from another large Oklahoma bank, so she knows what she's doing. Once you pick a bank, your work isn’t over yet. In some ways, it’s just beginning. Just because you approve of a bank doesn’t mean they’ll automatically approve you for a construction loan! The loan officer you’ve been speaking with is probably going to tell you "everything looks good" before the bank has had time to really look into your situation, so be aware of that up front and anticipate some back and forth with the bank before your loan gets finalized. Here's how the basic process works. Any loan means lots of paperwork. You'll gather up your bank statements, W-2s, tax returns, and other documents and take them to the banker. He will forward them to the underwriter—that mythical creature who has the magical powers to discern whether you are a good credit risk. In any construction loan process, the bank is probably going to call you back three or four times to ask for more documents or more explanation of the documents you already submitted. Why? Usually, because the underwriter told him to. When your loan gets approved, it'll probably be subject to some conditions. Some common conditions include requiring that the cost to build the house doesn't exceed some specified amount, that the appraised value of the house equals or exceeds some specified amount, and that your income doesn't change and you don't change jobs during the building process. There will probably be some other little details included that the bank thinks are important. Now you know how much you can borrow, and it's up to you to decide whether or not you can afford that amount. Just because the bank will loan you the money doesn't mean it's a good idea. The process of getting a construction loan will test your patience. If the banker was recommended by your builder, you'll wonder if your builder intended for you to endure such treatment. It really isn't the banker trying to be difficult, it's just a difficult process. Banks are heavily regulated by the government. There are more rules to follow than any one person can keep track of, and the penalties for violating those rules can be steep. So, the bank will do everything they can to ensure they meet all of the requirements while making the process as smooth as possible for you. Why does it take so long to get a construction loan? As you can see from above, the construction loan process is often one of the most challenging aspects of building a home on your land. It can be a frustrating process, but understanding why it takes so long can help ease some of the frustration. Here are two main reasons it takes so long to get approved for a construction loan. The housing crisis in 2008 resulted in lots of new federal regulations. Those regulations are designed to help protect the people borrowing money and hold the banks accountable to the decisions they make. Banks want to make sure they're covering everything, which can lead to them being overly cautious. And when they're extra cautious, they're also slow. Especially when the rules are constantly changing. There are checks, double checks, and triple checks to make sure everything is right and in line with regulations at every step of the process. One example is the fees the bank quotes you. They have to match the final numbers exactly. You as the customer have three days to review the final numbers. If there's a mistake, they take the time to correct the mistake plus give you another three days to review the final numbers. There's a hidden (but not secret) process at every bank when it comes to loaning you money. The loan officer that you meet with is more accurately described as the loan salesperson. They usually don't have the authority to make decisions—they're simply guiding you through the process. You give all of your information to the loan officer, and they turn it all over to the underwriter, or the "man behind the curtain." The underwriter scrutinizes all of your info and compares your financial situation to a checklist of bank and federal requirements. If they see something that's not typical or if a little more information will help you qualify for the loan, they'll call the loan officer to request that info. Then the loan officer calls you to request the additional information the underwriter needs. You may be thinking, "Why didn't you just ask for that information up front?" The reason is the loan officer doesn't know what information will be needed. The underwriter doesn't know every piece of detail needed either until they start reviewing your information. It's a process, and it takes time. While complying with all the federal regulations and waiting on the bank's hidden process can make it seem like the loan process takes forever, it's a necessary process. The checks and balances in place help ensure you get a loan you can afford that meets all the requirements of the bank and government regulations. Yes, it's frustrating and seems disorganized, but it's actually a well-defined process. Be patient and know they're working on it. Part of the construction loan process requires getting an appraisal on the home you’re planning to build. This happens when you buy an already built house too, but the evaluation of a home that hasn’t been built yet is different. The appraiser's job is to reasonably estimate the value of a home for the bank. The bank is investing in your home, because if you end up not being able to pay for it, they'll have to sell it. 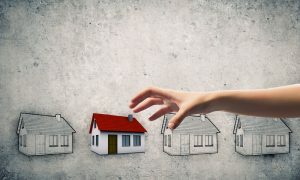 Most banks want to help you make the deal but you might run into issues if there are few comps for your house in the area. If you're planning on building a custom home, it can be helpful to know what might count against you in an appraisal, and how they'll be evaluating the plan for your home. You may want to rethink some of your home's features, or just put in more leg work to find comps for your home. Here are a couple of things to know about the appraisal process. Some features are what we call "low-value, high cost" items. They might be high on your list of desirables, and you may be able to find ways to fit them in, but they will probably count against you in an appraisal. A basement is a good example of this—you're basically building a really expensive concrete wall underground and putting a room or two inside. Considering the plumbing, excavation, and concrete cost, without adding a significant amount of square footage, a basement is not going to be considered a value-add by an appraiser. Another low-value, high-cost item is a wraparound porch. You have most of the structural elements of an extra room, but it doesn't count toward the square footage of your house. Does that mean you should give up your dreams of a wraparound porch or a basement? Not necessarily. But it's worth talking with your builder about whether or not that will make the appraisal for your house a bigger hurdle than you want. Some people are frustrated when they find out that these custom features may not help the appraised value of their custom home. From the bank's perspective, the value of your new home is based on the potential resale value, not on how much money you put into building it. If nearby homes that have sold recently don't have the same higher-cost features, they won't have the higher value either. But those are still the homes that your new home will be compared to. Let's say spray foam insulation costs around $5,000 extra for your home. Your appraised value doesn't increase by $5,000 just because that's what it costs. If surrounding homes also include spray foam insulation and sold for enough money to absorb those costs, you're in luck. But if the surrounding homes don't include spray foam insulation, it's not going to help you with the appraisal. Now let's look at an opposite example. Since the cost of adding 500 square feet is less than the average cost per square foot of the overall house, you'll get added appraisal value. The appraiser will use the average cost per square foot of comparable sales and multiply the square feet of yours by that amount, which increases the value of your home. The same mantra of location, location, location is true when you're building a custom home on your land and applying for a construction loan. Why? The total amount of your construction loan hinges on the appraised value of your not-yet-built home. And that appraised value depends heavily on recent comparable sales of existing homes in the same general area. If the values of recent home sales in the area are low, the lender can't justify the cost to build a new home based on nearby property values. We've seen that happen when the nearby houses are old, small, or built with inexpensive finishes. One of our recent clients wanted to build a smaller home but still a very nice home. When we worked through the design process, she selected a lot of higher-end features for the home. She also wanted large covered porches and patios, which add cost to build but don't count as square footage included in the appraisal. Another feature that again costs more and doesn't get included in the appraisal was the large detached garage and shop. All of the recent home sales in the area were older, smaller homes. They didn't sell for a high enough price to justify the investment this client needs to build the home she wants on the land she already owned. Now, that doesn't mean she can't build her home where she wants. But it does mean more of the cost will be coming out of her pocket because she can't get approved for a construction loan to cover the full cost to build. Be sure to consider the value of nearby homes when you're deciding where to build. Comparable sales, even if they're not quite comparable in size or features, will determine how much the bank will allow for your construction loan. If you're looking for land, check out the recent sale prices of homes nearby before you decide to buy that land. This is just one of many factors that affect financing for your custom home, so be sure to read our other financing articles so you're prepared for every possibility. How does an appraiser evaluate your house? One reason low-value, high-cost items count against you in an appraisal is that they increase the cost of your house proportionally more than they increase the square footage of your house. That factors into the appraisal process, since the appraiser is acting on the bank's behalf to decide if your home is a worthwhile investment. #1 Value comparison: This method relies on comparing properties that are similar to your home plan to estimate your home's value. It's the most commonly used, and that's why finding comp properties for your home is necessary. #2 Cost approach: The appraiser estimates the cost of construction. This method isn't very accurate, though, because appraisers use a national database to determine cost, and materials cost different amounts based on what part of the country you're in. #3 Income approach: This takes into account whether or not the home is going to be an income-producing property. It's not a very common method of appraisal. Armed with this information, you can determine whether or not you need to cut out any high- cost, low-value items in your home, or if you need to find more comp properties. If you're building in a relatively undeveloped area, it's especially important to find comp properties to share with your appraiser. Your builder or real estate agent should be able to help you find good ones. I mentioned loan-to-value earlier as something to ask potential bankers about, but it needs more discussion, partly because it’s easy to get the terms “loan-to-value” and “loan-to-cost” mixed up but the difference between the two is important. Let's look at the difference and how it affects your construction loan. 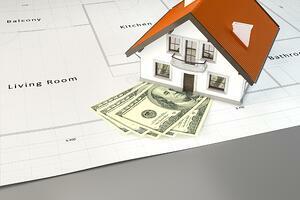 When you take out a construction loan, the banker is going to lend you a specific amount of money to build your home. That loan will provide just enough money to build while minimizing the risk to the bank. Make no mistake, the bank's first concern is their own money despite what they tell you about their awesome customer service and so forth. The bank has to be sure they don't loan you more money than the house will be worth. That’s why they hire the appraiser who analyzes the market and gives a professional, unbiased opinion of the value of the house you're proposing to build. With that value established, the bank will lend you no more than a specified percentage of that number. In most cases, it's 80 percent. So, the loan they'll make you is 80% of the value of the finished home. They call that a loan-to-value (or LTV) of 80%. But be careful because sometimes the banker will simply talk about loan-to-value (or LTV) when they really mean loan-to-cost. Let's say you're going to build a $200,000 house, but it appraises for $220,000. Since 80% of the appraised value is $176,000, that's what the banker will lend you, right? Not necessarily. It's important to ask any potential bankers up front what they will do if the appraised value is higher than the cost. When the cost to build is less than the appraised value, some bankers will only loan you 80% of the cost. If a bank says that's their policy, you just ruled out that banker unless you have another compelling reason to use them. That being said, if the cost and appraised value are dramatically different, no banker is going to loan you more than the actual cost to build the house. At least not if they want to stay in business. What you're looking for is maximum flexibility in your construction loan so you don't have to bring a lot of cash to the table. Loan-to-value is an important term to understand when setting up your construction loan, so be sure to ask the right questions up front. Then consider loan-to-value along with easy-to-compare interest rates and other factors when deciding which banker and construction loan are right for you. Something else we’ve mentioned before but that deserves a closer look is how to know what kind of down payment you’ll need for your custom-built home. The answer, like many in life, is "it depends". What does it depend on? Here are a few answers that will hopefully help you as you plan your build. We're going to talk about the cash you'll need for a down payment, why the bank wants that down payment, and how the bank comes up with the amount. Banks see construction loans as riskier than permanent mortgages, mainly because they are lending the bank's money, not selling the loan to investors as mortgage companies do. Also, there's always the risk that the bank will get stuck with a construction loan if the customer isn't able to qualify for the permanent loan once the house is built. You can also see that in every scenario, the variable that you don't know up front, but need to know in order to answer the question of how much cash you need as a down payment on your construction loan, is the appraised value. The only way to get that number is to do the appraisal. How Much Will My Payment Be Each Month? As if you didn’t have enough to worry about with finding a banker, getting the loan approved, and the appraisal, at some point you’ll have to start paying back that construction loan. Here's how you figure it out. 2. You don't make principal + interest payments, only interest. When you close on your construction loan, you haven't actually borrowed any of the money yet, so at first, there's no interest adding up. Then your builder installs the plumbing under the slab and pours the slab. You take a draw from your construction loan and pay the builder. Then the builder frames the house and installs the roof shingles. You get another draw and pay the builder. Here's a little trick that might make the monthly interest payments less painful. Assuming your house appraises for enough initially to keep the loan to value within limits, you can actually finance the interest payments. That simply means the bank will calculate the amount of interest you'll likely owe during the term of your construction loan and increase the amount of the loan by that amount. Then, you'll make a draw against your permanent mortgage loan to make the interest payment. Hopefully, that information helps you plan your budget during the construction process and sheds just a little more light on what can be a seemingly mysterious process. 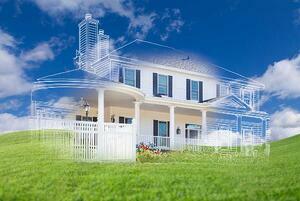 Getting a construction loan for building a new home on your lot or land can be a daunting task. In 53 years of home building, we’ve helped our customers get literally hundreds of construction loans, but the banking industry evolves just like every other industry, and we’re still learning new things. I hope that with the information I’ve shared here you will feel more confident seeking a construction loan and getting your home building project started. The number one tip I can give a customer home buyer is to stay informed every step of the way. Find a good builder and good banker who are experienced and willing to share their knowledge with you throughout the process so that your home building project is a success. Each family and each home have unique circumstances that no blog post or ebook can cover completely, but as you continue to research and consult with the right professionals on your home building journey, you will have all the tools you need to build the house of your dreams.